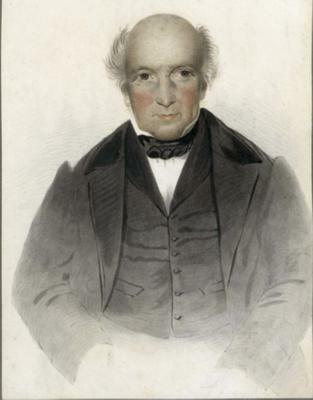 This is a hand coloured portrait of William Dow, made in 1854 or 1855 by Hoppner Francis Meyer in Toronto. Dow came from Banffshire, Scotland, in 1832 and settled in Whitby at Glen Dhu farm. It is a copy of a b&w image already in the Whitby Archives collection. I was told the image was a hand coloured lithograph made for each of his children and that back in the 1980s three copies were known to exist: one from John Dow to Herb Dow in Regina; one from Thomas Dow to Ben Fleming in Ottawa, and my copy which came down to me from Robina Dow (m. Jonathan Foote MD) through their granddaughter Helen Robina Foote. Meyer was active 1832 to 1862 and was named after the famous English portrait painter John Hoppner.